Epubor Kindle DRM Removal for Mac is a powerfull software to remove DRM protections from Kindle for PC/Mac with no quality losing. Just remove the AZW/PRC/Mobi/Topaz DRM header, no change on the files. 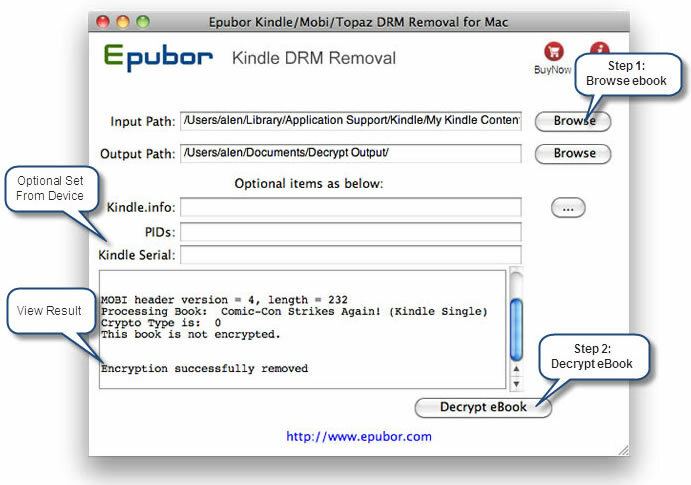 Epubor Kindle DRM Removal for Mac quickly and easily remove Kindle ebook DRM protection. Read them on iPad, NOOK, Sony Reader, Kobo or other devices without limitation, you can print converted Kindle ebook. * Fast - Remove DRM from all you ebooks within seconds. * Easy to use - It is very easy to use, just 1-click to decrypt Kindle ebook. * 1-click to break the DRM - Kindle DRM Removal for Mac quickly and easily remove Kindle DRM protection with 1-click, simple to handle. With clear and simple layout, Kindle DRM Removal for Mac is very easy to use. * No quality losing, the same quality as source ebook - Kindle DRM Removal for Mac just remove DRM from files header, with the same quality as source Kindle files, no changes to original Kindle files. * No need to backup source files - Kindle DRM Removal for Mac sets the default output folder in a different folder, so you don't need to backup source files before removing DRM from Kindle. Qweas is providing links to Epubor Kindle DRM Removal for Mac 2.4.3 as a courtesy, and makes no representations regarding Epubor Kindle DRM Removal for Mac or any other applications or any information related thereto. Any questions, complaints or claims regarding this application Epubor Kindle DRM Removal for Mac 2.4.3 must be directed to the appropriate software vendor. You may click the publisher link of Epubor Kindle DRM Removal for Mac on the top of this page to get more details about the vendor.